Woodbury native and MTSU coach Rick Insell. 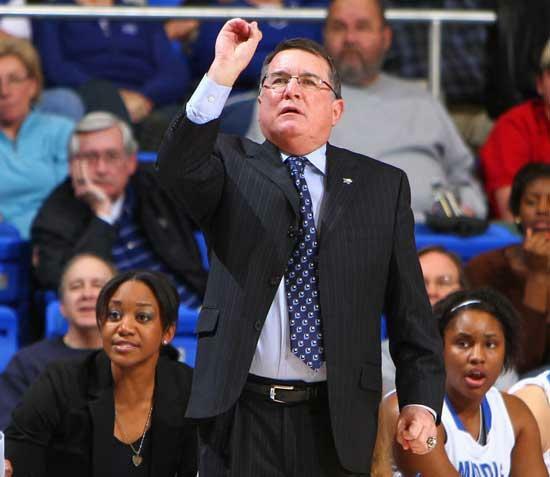 Legendary Middle Tennessee women's basketball coach Rick Insell will be the guest speaker for the first Cannon Courier Hall of Fame and All-Sports Awards Banquet at Cannon County High School, May 16. Insell, a Woodbury native, has led Middle Tennessee into postseason play in each of his six seasons at his alma mater, producing five NCAA Tournament berths and one WNIT appearance. He also has developed three WNBA Draft picks from the Lady Raiders' program. "Anytime you come back to where you grew up and speak to young people, it's an honor and that's what we are all about," Insell said. "I have tried to give back (to the community) since I've been at Middle Tennessee and while I was at Shelbyville, but Woodbury is home. "I would not swap Woodbury for any place in the country. I am from Woodbury, it's my hometown and I'm proud of it. I probably have spent more time in Shelbyville and Murfreesboro coaching, but Woodbury is my hometown." Some of Cannon County High School's best and brightest athletes will be honored at the first Cannon Courier Hall of Fame and All-Sports Awards Banquet. The banquet also will include the induction of Cannon County's first Hall of Fame class. The Cannon County Hall of Fame will be on display at Cannon County High School. The Cannon Courier will announce its Player of the Year for each of Cannon County High School's 11 sports, in addition to the naming of the Female and Male Athlete of the Year, Female and Male Scholar Athlete of the Year, and the Lions Award for character, leadership, integrity and sportsmanship. Additionally, the first Cannon County Hall of Fame class also will be enshrined. "Cannon County has a rich history in sports and this is the way for the voice of Cannon County - The Cannon Courier - to put forth a forum to recognize and honor both athletes and supporters from year's past, as well as those of the future," Cannon Courier Owner/Publisher William R. (Ron) Fryar said. Insell's coaching career began at West Side Elementary in Woodbury. From there, he became one of the nation's winningest coaches. He has won 76 percent of the games he has coached at Middle Tennessee with a remarkable 148-47 overall record. He is 90-12 (88 percent) in Sun Belt Conference games. Prior to becoming Middle Tennessee's seventh women's basketball coach in 2005, Insell became a prep icon at Shelbyville Central where he led the Golden Eaglettes to an unprecedented 10 Class AAA state championships, two USA Today National Championships and a sterling 775-148 (84 percent) record. Insell said he not only is delighted and honored to be selected as the first speaker for such an important event, but that he also is excited to see the Hall of Fame inductees and to recognize the current student-athletes. "There are a lot of great athletes and coaches who have come out of Cannon County and the people in Cannon County know their story," Insell said. "Woodbury is like a lot of communities ... sports mean something to these people. It is something they take great pride in and Woodbury is no different." Insell's Cannon County pride was on display during the 2011 TSSAA Girls State Tournament at MTSU's Murphy Center when the Cannon County Lionettes reached the Final Four before falling short of their goal of a state title. "My wife (the former Deborah Spry of Woodbury) wore her Cannon County colors to the (State Tournament) and, to be honest, I do have to be neutral when I'm sitting there in attendance, but I was not neutral when Cannon County played," Insell said. "I like Coach (Michael) Dodgen and I wanted Cannon County to win. They won that first game and I was excited. I wanted them in the finals and that didn't happen, but I was so proud of the crowd Woodbury brought. They had the biggest crowds of the week. They support their team and community." Tickets, which are $12, go on sale at The Cannon Courier April 25.